1. Preheat the oven to 220°C, gas mark 7. Cut the cauliflower into small florets, reserving the core and cutting this into similar sized pieces. Scatter in a roasting tin and drizzle with 3 tbsps of the oil and a little salt and pepper. Roast for about 40 minutes, turning the cauliflower once or twice until turning pale golden. 2. Heat the remaining oil in a saucepan and gently fry the onion and celery for 5 minutes to soften. Reserve a couple of large spoonfuls of the cauliflower florets (enough for each serving to have a generous scattering) and add the remainder to the saucepan with the cumin and stock. Bring to the boil and reduce the heat to a gentle simmer. Cover with a lid and cook for about 20 minutes until the cauliflower is completely tender. 3. While cooking make the cheese crisps. Line a large baking sheet with baking parchment. Finely grate the cheese onto the baking sheet. Sprinkle with the thyme and mix together. Spread the cheese in a thin layer all over the baking sheet. It should be thin enough to just see the paper through the cheese. Cook under a moderate grill for 4–5 minutes until bubbling and turning pale golden. Leave to stand while finishing the soup. 4. Purée the soup in a liquidiser or blender. (Alternatively blend in the saucepan using an immersion blender.) Heat through with the crème fraîche and a little seasoning. 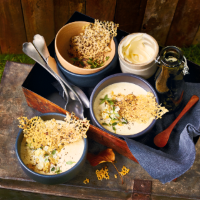 Spoon into serving bowls and swirl with extra crème fraîche. Scatter with the cauliflower florets and flake the cheese crisps on top.